Seldom do museums in Washington, D.C. engage in collective undertakings, in spite of their eminence and professional staff. 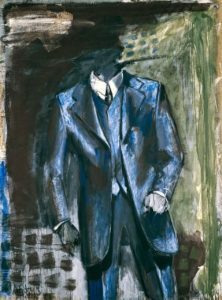 Unexpectedly, the Smithsonian’s Hirshhorn Museum and Sculpture Garden and The Phillips Collection have chosen to work in partnership on complimentary exhibitions showcasing the works by the German painter Markus Lüpertz. This is the first official alliance between the two venues. 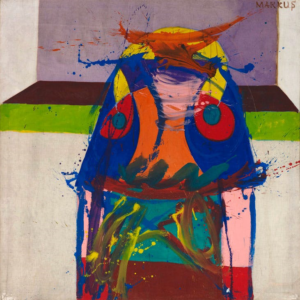 The Hirshhorn’s exhibition titled “Markus Lüpertz: Threads of History,” curated by Evelyn Hankins, focuses on Lüpertz’s early work from 1962 to 1975, in the context of post-war Germany; while Dorothy Kosinski, director of the Phillips Collection, curated “Markus Lüpertz,” offers a retrospective of the artist’s five-decade oeuvre. Above, left: Markus Lüpertz, Stil: Eins-Zehn VII—große Form mit Linie 2 (Style: One-Ten VII—Large Shape with Line 2), 1977. Oiland distemper on canvas, 63 3/4 x 51 1/4 in. Private collection © 2017 Artists Rights Society (ARS), New York /VG Bild-Kunst, Bonn. The dual shows provide audiences with an in-depth look into Lüpertz’s art. 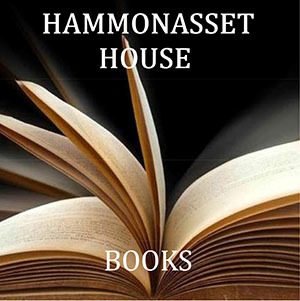 The conjointly produced catalogue offers original scholarship on Lüpertz’s evolution, with insightful essays by Hankins and Kosinski. The scholarly compositions by Richard Shiff and Peter Weibel offer additional perspectives about this artist, and the reproductions are exquisite! 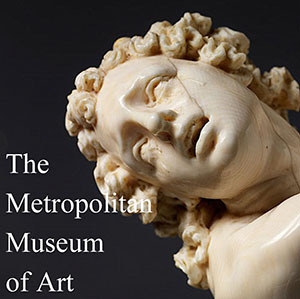 Moreover it provides an extensive context about Lüpertz, his sources and influences on his work as well as a wide-range of images of his sculpture. However, it is strange to not see any of his three- dimensional work in the Phillips retrospective. Why only paintings? Right: Markus Lüpertz, Der große Löffel (The Large Spoon), 1982. Oil on canvas, 78 3/4 x 130 in. Museum of Modern Art,New York, Anne and Sid Bass Fund and gift of Agnes Gund, 1986 © 2017 Markus Lüpertz / Artists Rights Society(ARS), New York / VG Bild-Kunst, Germany,Digital Image© The Museum of Modern Art/Licensed by SCALA / Art Resource, NY. 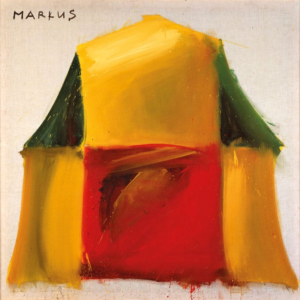 Markus Lüpertz was born in the former Czechoslovakia in 1941, however as a child he immigrated with his family to Germany, where in 1961, he began his artistic career. According to Hankins, he is a largely self-taught and commenced painting abstract variations of ordinary objects such as cake tins, tents and tree trunks. This comes of no surprise, given the renown of Abstract Expressionism and the upsurge of the Pop art movement in the mid-1950s, in Britain, and the late 1950s in the United States. Steadily, he struggled with finding a stylistic method that relied neither on figuration nor abstraction. His poetic images depict a fusing of abstraction and representation with references to popular culture, scriptural and mythical themes and his country’s Nazi era. 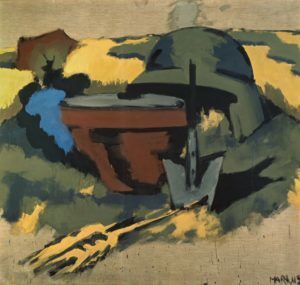 Lüpertz’s latter paintings of military helmets and supplementary wartime emblems caused controversy, especially in the 1970s, initiating a fraught relationship between him and his public. Lüpertz has said, “You cannot understand the artist in his time, you can only love or hate him”. Anselm Keifer, and Markus Lüpertz were some of the first artists who emerged amongst a generation of post-war German artists to tackle the Nazi past through rejuvenated historical and mythological imagery. Left: Markus Lüpertz, Männer ohne Frauen: Parsifal (Men without Women: Parsifal), 1993. Oil and tempera on cardboard, 33 x 20 1/2 in. Private collection© 2017Artists Rights Society (ARS), New York / VG Bild-Kunst, Bonn. Color is a powerful element throughout Lüpertz’s inventive oil paintings, as they are filled with swift strokes, where paint is thickly spread with a densely impasto technique. Instead of bold reds, blues or yellow dominating his canvases, it is his use of subtle olive green, ocher yellow and black paint that is distinctive. 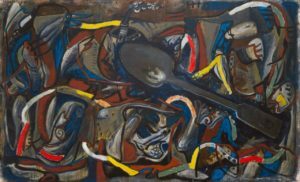 His art evinces the influence of Picasso, Surrealism, as well as American abstract painters as Willem de Kooning, Arshile Gorky, and Philip Guston. Lüpertz is a contemporary with artists affiliated with Neo-Expressionism in the 1980s including Anselm Keifer, perhaps the strongest, Georg Baselitz and Jorg Immendorff. However, unlike his contemporaries, he is little known to the American public outside the art world. 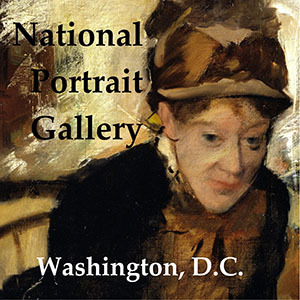 The D.C. exhibitions mark his first in-depth coverage in the United States. Of the two shows, the Hirshhorn exhibit of early work from the 1960s and `70s is the more focused, deliberate and successful display. 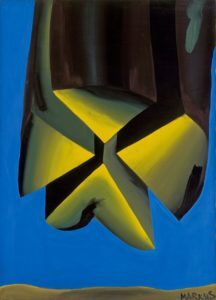 It includes large format canvases that disclose his new approach to painting, using simplified forms and an intensification of elements. I strongly recommend that visitors see the Hirshhorn show first, since it provides a succinct prelude to this artist and a valuable context for the paintings’ essential themes. The informative wall texts afford viewers a clear guide to traverse this display. After seeing both exhibitions, it is clear that the paintings from Lüpertz’s formative years represent some of his strongest. At the Phillips, much significant information is lacking despite its inclusive presentation of work spanning five decades, and Lüpertz’s manifesto about painting. 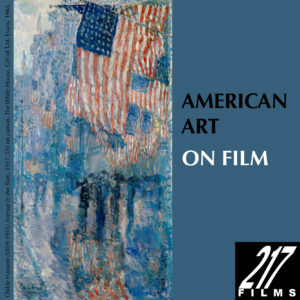 The use of new screen media would have enriched this show by giving viewers a historical context about the artist, his work, and Germany. The Phillips retrospective should provide information about the various eras that Lüpertz was working, along with other artists and Germany’s involvement in World War II—many younger viewers would benefit. More on the Phillips shortly! Left: Markus Lüpertz, Deutsches Motiv—dithyrambisch II (German Motif—Dithyrambic II), 1972. Distemper on canvas, 74 x 78 in. Galerie Michael Werner Märkisch Wilmersdorf, Cologne, London & New York © 2017 Artists Rights Society (ARS), New York / VG Bild Kunst, Bonn. The colorful paintings “Donald Duck’s Hochzeit (Donald Duck’s Wedding),” 1963, looks as if to be influenced by the painterly style of COBRA artists, as well as the works of Franz Kline and Willem de Kooning. Although the orange bill and eyes of ‘Duck’ are recognizable, they become obscured by the artist’s passionate brush strokes. 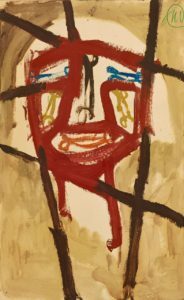 They offer a prime example of Lüpertz’s early work, melding a mixture of high and low art, along with pop art and abstract expressionism. Right: Markus Lüpertz, Baumstamm Abwärts—dithyrambisch (Tree Trunk Down—Dithyrambic), 1966. Distemper on canvas, 98 1/2 x 70 7/8 in. Hall Collection, Courtesy Hall Art Foundation © 2017 Artists Rights Society (ARS), New York / VG Bild-Kunst, Bonn. The expansive walls of the Hirshhorn lend themselves to the dithyrambs, entitled Cyclops I, II and III (1973), and they perhaps epitomize the most imposing figurative works in either exhibition. The three looming, possessed uniformed green officers fill an entire gallery wall, and are haunting symbolic reminders of Germany’s Nazi past. Left: Markus Lüpertz, Mann im Anzug–dithyrambisch II (Man in Suit—Dithyrambic II), 1976. Distemper on canvas, 98 1/2 x 73 1/2 in. Private collection © 2017 Artists Rights Society (ARS), New York / VG Bild-Kunst, Bonn. Right: Donuald Ducks Hochzeit (Donald Duck’s Wedding) (1963), Markus Lüpertz. Courtesy Hall Art Foundation/© the artist. The Phillips show presents an array of a complex work and demonstrates that this is a prolific artist who loves to paint as well is enamored with art history and antiquity. 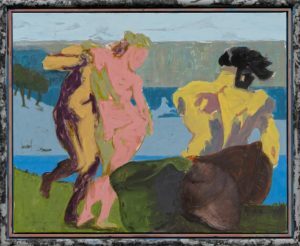 Many of the romantic works from the 1980s depict Lüpertz’s shift away from German history to inspiration from artists as Gustave Courbet, Francisco Goya, and Nicolas Poussin. The pieces depict Lüpertz’s nascent interest in creating works that prompt us to meditate on individual compositions rather than his delivering profound messages about the world or life. His lively paintings capture the mystical nature of classical art through a contemporary idiom. A few highlights include “Mann im Anzug—Dithyrambisch II” (“Man in Suit—Dithyrambic II”, 1976, “Poussin—Schaukel II” (“Poussin—Swing II”), 1989 and “Arcadia — The High Mountain,” 2013. Left: Markus Lüpertz, Arkadien—Der hohe Berg (Arcadia—The High Mountain), 2013. Mixed media on canvas, 51 1/4 x 63 3/4 in. Private collection © 2017 Artists Rights Society (ARS), New York / VG Bild-Kunst, Bonn. 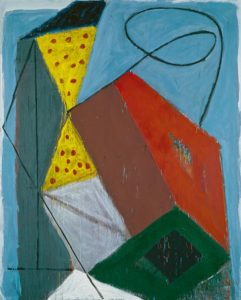 And, if one happens to be in New York City in the coming weeks, you can see his new paintings at the Michael Werner Gallery until July 17th—“Markus Lüpertz – New Paintings. 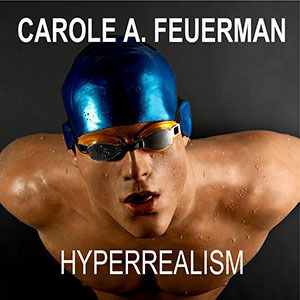 ” It features work bearing inspiration from old mythological images from Ancient Greek to Renaissance art with a newfound energy and resolve pervading his figurative canvases set in a type of Garden of Eden or a private arcadia. Der Grosse Narziss (The Great Narcissus), 2016 is a zinger! Siegfried Gohr is a German art historian, curator and freelance journalist who has written monographs on Pablo Picasso, René Magritte and Markus Lüpertz. and articles on Ernst Wilhelm Nay, Max Beckmann and Jörg Immendorff. Markus Lüpertz exhibition catalogue, Hirshhorn Museum and Sculpture Garden and The Phillips Collection, Sieveking Verlag, Germany p. 19.